Grilled Green Tomatoes Have Great Health Benefits! Green tomatoes have most of the same health benefits that red tomatoes have. They have about the same amount of beta carotene, even though they are green. The beta carotene is just temporarily hidden by the chlorophyll. In some ways, green tomatoes are even better than red. They have slightly more vitamin C than red tomatoes, and they have three times the amount of calcium. 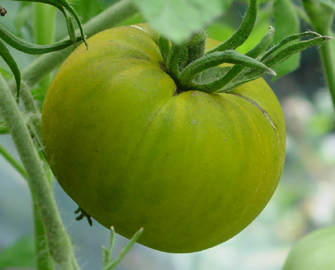 Tomatoes are just flat out good health food, so if you’ve never tried green tomatoes, give them a try. Try Some Grilled Green Tomatoes! Fried Green Tomatoes are a southern standard, but did you realize you can also grill green tomatoes? In fact, they work much better on a grill than red tomatoes, since they aren’t so soft yet. Preheat grill of your choice (indoor or outdoor). Brush one side of tomato with oil, sprinkle with seasoning to taste, then place on grill. Immediately brush other side of tomato with oil and season to taste. This is simple cooking, and an easy way to add a healthy food to your diet.